Hey, we’re getting closer! 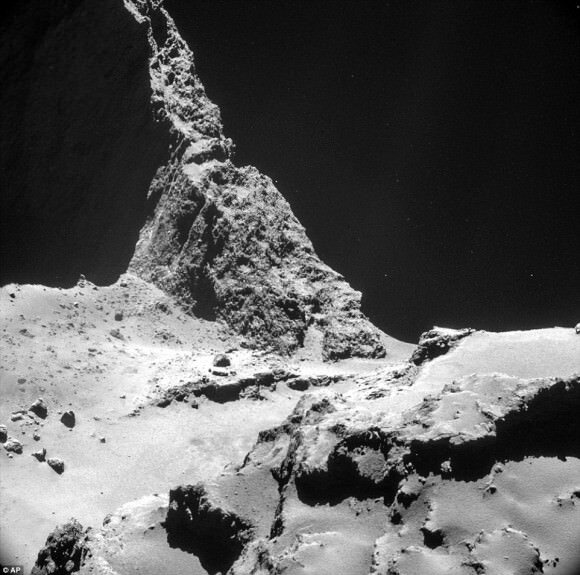 This photo was taken by Philae’s ROLIS instrument just 1.8 miles (3 km) above the surface of 67P/Churyumov-Gerasimenko at 8:38 a.m. (CST) today. The ROLIS instrument is a down-looking imager that acquires images during the descent and doubles as a multi-wavelength close-up camera after the landing. The aim of the ROLIS experiment is to study the texture and microstructure of the comet’s surface. ROLIS (ROsetta Lander Imaging System) is a descent and close-up camera on the Philae lander. I know, I know. You got a fever for more comet images the way Christopher Walken on Saturday Night Live couldn’t get enough cowbell. Telemetry from the probe has been sporadic. Data streams come in strong and then suddenly cut out only to return later. These fluctuations in the radio link obviously have the scientists concerned and as yet, there’s no explanation for them. Otherwise, Philae landed in splendid fashion almost directly at the center of its planned “error ellipse”. Scientists and mission control will work to hopefully resolve the harpoon and radio link issues. The next live webcast begins tomorrow starting at 7 a.m. (CST). Although nothing definite was said, we may see more images arriving still today, so stop by later.